October is Fair Trade month! Celebrate by supporting Fair Trade certified companies and products with your purchases. 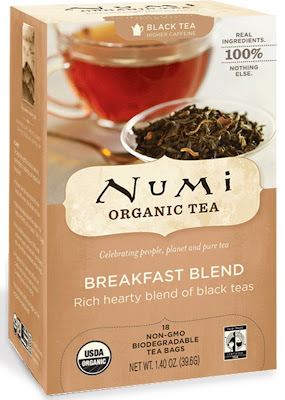 One of my favorite Fair Trade products is Numi Organic Tea. We drink so much tea in our house, that it's nice to feel like we're making a difference by putting our money where our mouth is to support farmers and ensure they are paid a fair wage for their labor. Since I need a twice daily caffeine-fix, but I don't drink coffee (I drank enough coffee in college to sink a ship), I opt for a black tea that packs lots of perk -- and my favorite Numi Organic Tea is their Breakfast Blend. It is a blend of organic black teas, including: malty Assam, robust Ceylon, brisk Chinese Keemun and hints of floral Darjeeling. The tea bags themselves are also non-GMO and biodegradable. I really love the smooth, creamy taste of Numi's Breakfast Blend, and I like that it doesn't leave a twangy aftertaste, like many teas do. Check out Numi's entire collection of various organic teas, and raise your mug to toast Fair Trade efforts with every cup you enjoy.